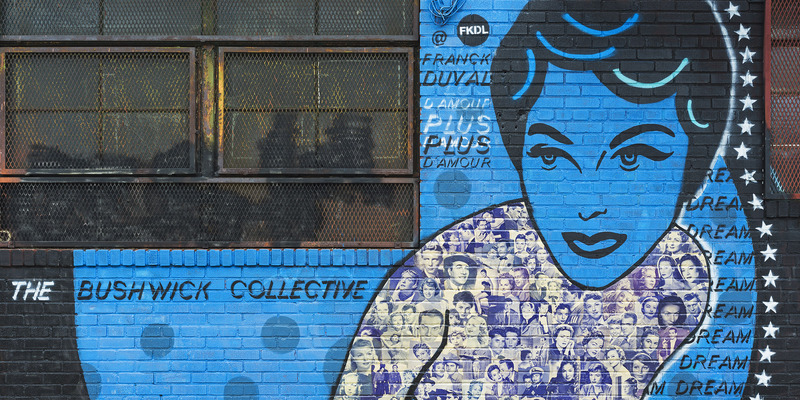 The Bushwick Collective is a non-profit outdoor gallery created in 2012 to bring works by artists from around the world to the streets of Brooklyn. Every year, on the first Saturday in June, the Bushwick Collective brings leading street artists to Bushwick, the heart of street art in Brooklyn. They host a block party on and around Troutman Street. Partygoers watch the neighborhood come alive with new works being created before their eyes. The results of year’s block party were particularly rich: great pieces by some of the most innovative artists in the space, like FKDL, Ruben Ubiera, and Tom Bob. We encourage you to take a trip to Bushwick to see them for yourself! The Bushwick Collective centers on Troutman Street in Bushwick, Brooklyn. While there are street art gems throughout the neighborhood, most of the Bushwick Collective’s pieces are concentrated on the streets highlighted on the map below. Here are some of our favorite pieces from this this year’s Bushwick Collective Block Party. We’d love to hear from you what you think about this year’s Bushwick Collective works. Share your reviews and photos in the comments!